Govardhana Hill (Devanagari: गोवर्धन), also called Mount Govardhana, Giri Raj and Royal Hill, is a sacred Hindu site in the Mathura district of Uttar Pradesh, India on an 8 km long hill located in the area of Govardhan and Radha Kund, which is about 21 kilometres (13 mi) from Vrindavan. Known as Govardhan or Giriraj it is the sacred center of Braj and is identified as a natural form of the Lord Krishna himself (Govardhana sila). The name 'Govardhana' has two primary translations. In the literal meaning, 'Go' translates to 'cows', and 'vardhana' translates to 'nourishment'. Another meaning of 'Go' is 'the senses' and 'vardhana' can also mean 'to increase' - thus the name is also translated by devotees of Krishna as 'that which increases the senses' in their attraction to Krishna. In this connection, it is believed that the personality of Govardhan blesses the devotee by increasing his devotion (bhakti). Thus, by residing in the foothills of Govardhan Hill, all the senses and the respective duties of a soul attain divinity and are more inclined to perform service to Krishna. 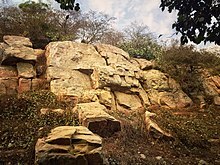 Govardhan Hill is considered a sacred site because it is the setting for many legends relating to the life of Lord Krishna, the deity believed to be embodied in the earth of the hill. Krishna and his brother Balaram are said to have spent many happy hours roaming among its shady groves, pools, caves and lush cow-pastures. An Eden-like sanctuary, the area's waterfalls, garden-grove (van), arbour (nikunj), water tank (kund), and flora are depicted in scenes of Krishna's adventures and raas with Radha. The buildings and other structures on the Hill date from the sixteenth century. As of 2013[update], there is no known archaeological evidence of any remains of greater age. The sandstone monument and lake of Kusum Sarovar. There are legends of Krishna’s saving the hill from a flood, "dalliances with gopis (cow-herdresses)’’ and interactions with demons and gods. Artwork has been created of the Hill represented as a bull and a peacock, Krishna in a cave, the Hill as a mountain of food Annakut, depicted in the floods brought on by Indra, and with the Yamuna River. Govardhan Puja is celebrated on the day after Diwali. It is the day upon which Lord Krishna defeated Indra, the deity of thunder and rain. As per the story, Krishna saw huge preparations for the annual offering to Indra and questions his father Nanda about it. He debated with the villagers about what their 'dharma' truly was. They were farmers, they should do their duty and concentrate on farming and protection of their cattle. He continued to say that all human beings should merely do their 'dharma', to the best of their ability and not pray or conduct sacrifices for natural phenomenon. The villagers were convinced by Krishna, and did not proceed with the special puja (prayer). Indra was then angered, and flooded the village. Krishna then lifted Mt Govardhan and held it up as protection to his people and cattle from the rain. Indra finally accepted defeat and recognized Krishna as supreme. This aspect of Krishna's life is mostly glossed over - but it actually set up on the basis of the 'karma' philosophy later detailed in the Bhagavad Gita. According to ancient Vaishnava legends the Vedic Deva (demigod akin to guardian angel), Indra (god of rain & lightning) was feared by human beings because he would either give the people no rain or flood them if he was not satisfied with their worship. When Krishna found out, he opposed the performance of sacrificial worship for Indra. He emphasized the importance of karma and doing ones duty. This made Indra angry at the boy Krishna (one of the incarnations of the Supreme God ). Indra thus invoked many clouds to appear in the sky and schemed to flood the region with rains lasting for seven days and seven nights. 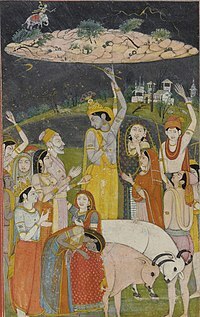 Krishna in reply then lifted Govardhan Hill, under which all the animals and people of the region took shelter, safe from the rains of Indra's fury. Ultimately, Indra accepted defeat. He offered his prayers and left to his heavenly kingdom. It also represents the downfall of Indra, and a new beginning in Hindu philosophy, from a more sacrificial/ appeasement oriented worship, to a more spiritual plane of thought. This evolution of thought in Hinduism was brought about by Krishna, and therefore he has been the most important Hindu deity since then - considered an 'avatar' of the supreme. ^ a b Dev Prasad (27 January 2015). Krishna: A Journey through the Lands & Legends of Krishna. Jaico Publishing House. pp. PT 147. ISBN 978-81-8495-170-7. ^ a b Henry George Keene (1878). A Handbook for Visitors to Agra and Its Neighbourhood. Thacker, Spink. pp. 71–72. 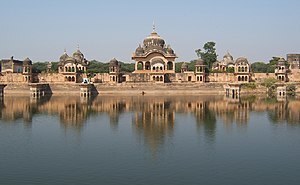 ^ "Vrindavan to Radha Kund". Google mpas. Retrieved 7 April 2017. ^ Kapila D. Silva; Neel Kamal Chapagain (2013). Asian Heritage Management: Contexts, Concerns, and Prospects. Routledge. p. 178. ISBN 978-0-415-52054-6. ^ a b c Kapila D. Silva; Neel Kamal Chapagain (2013). Asian Heritage Management: Contexts, Concerns, and Prospects. Routledge. pp. 178–179. ISBN 978-0-415-52054-6. ^ Kapila D. Silva; Neel Kamal Chapagain (2013). Asian Heritage Management: Contexts, Concerns, and Prospects. Routledge. p. 180. ISBN 978-0-415-52054-6. ^ Ritika Handoo (2 December 2016). "Here Lord Krishna lifted Govardhan hill—This can be your travel guide to reach Giriraj Temple!". ZeeNews. Retrieved 7 April 2017. ^ a b c d Amit Sengupta (16 June 2015). "Spiritual Sojourn (sic) in Govardhan". Retrieved 7 April 2017. ^ "Bhagavad Gita Chapter 3 - Karma Yoga". Bhagavad Gita. Retrieved 2018-06-08. ^ Bhag-P 1.3.28 Archived 2013-01-23 at the Wayback Machine 'Krishna Is the Source of All Incarnations'. Rajasekhara Dasa (2001). Govardhana Hill: India's Most Sacred Mountain. Vedanta Vision Publications. ISBN 978-1-310-32111-5. This page was last edited on 29 March 2019, at 01:56 (UTC).